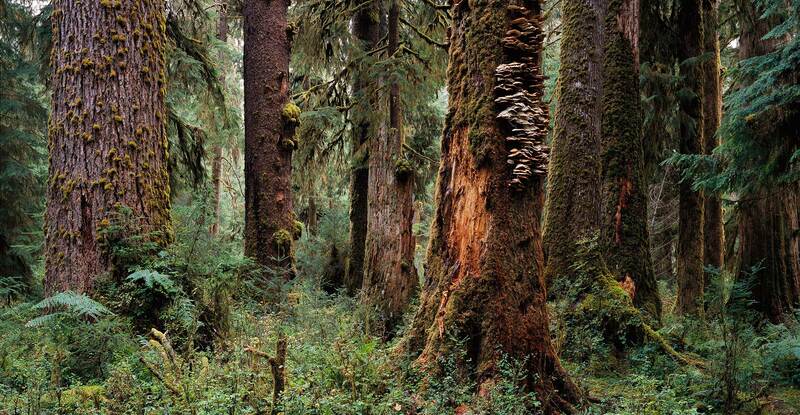 The small patches of old growth forest remaining in the once vast rainforests of the Pacific Northwest evoke the enchanted forests of Old World legend, full of giant Western Hemlocks, Douglas Firs, Sitka Spruces, and Red Cedars cloaked in moss and vines. This part of the Hoh Rain Forest, one of the finest examples of primeval temperate rainforest left in the world, was protected by the creation of Olympic National Park. Unfortunately, the rest of this forest has been extensively logged in the 20th century.